Our family loves to go out to the movies and when we do it is important for me to get a good, filling meal on the table before we head out – makes it so I don’t have to buy as many snacks at the movies! We are often in a hurry and I usually want something that doesn’t take long to cook. 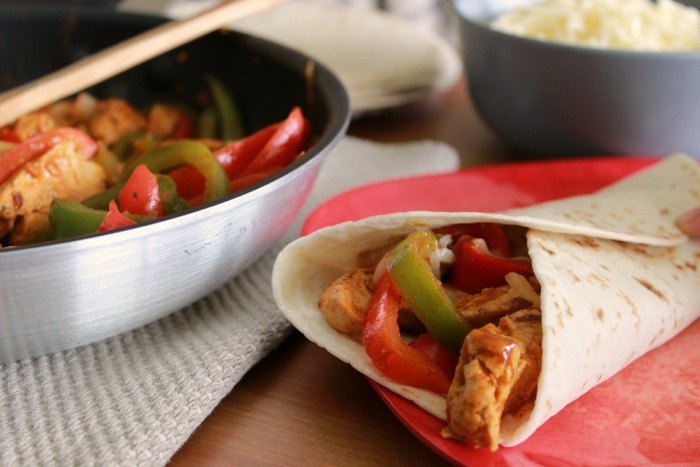 I have a handful of simple and quick chicken dishes that make dinner quick and easy and one of them is this Grilled Chicken Fajitas recipe using Tyson Grilled and Ready Soutwest Chicken Strips. While doing my grocery shopping at Walmart I bought several bags of the Tyson Grilled and Ready chicken strips. You can find these in the frozen chicken section next to the chicken nuggets. For my family this was a no brainer because they currently have a promotion going on right now to get free tickets to see the movie Blended – A movie I know my family will love! Can’t beat Dinner and a movie especially when the movie is free! I am a huge Drew Barrymore fan and my cousins have been in some movies with Adam Sandler so I am a fan of his as well. I knew when I saw the trailer for this movie that it would be one that we would want to see. I just love a movie that keeps me laughing and I am sure this one will. 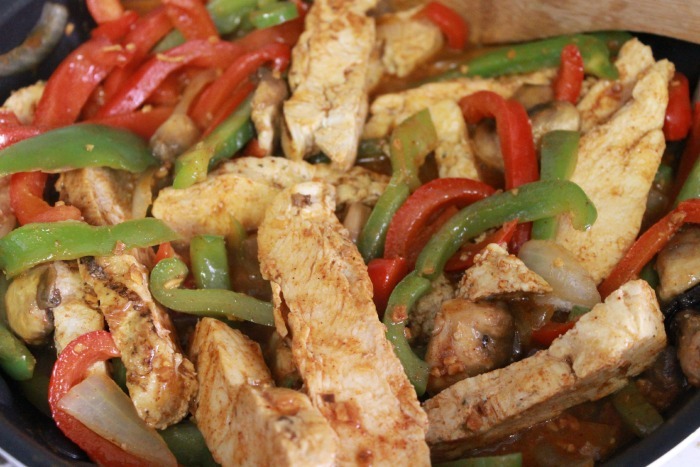 So for dinner I decided to cook up some Chicken Fajitas. 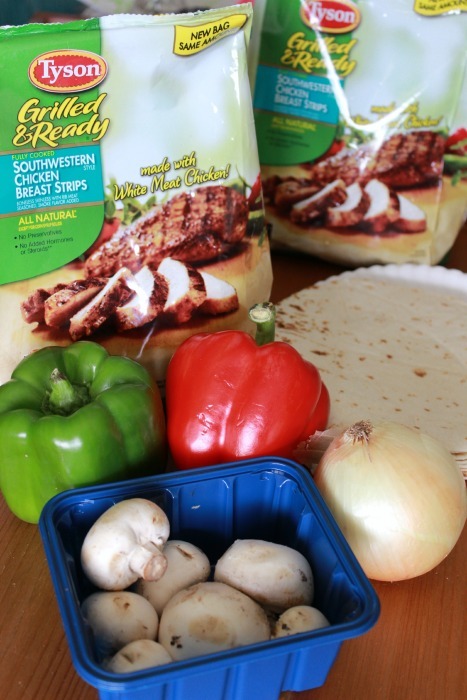 With the Tyson Grilled and Ready strips this meal comes together very quickly. 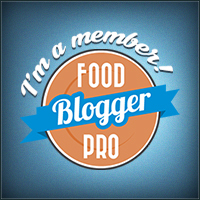 Cheese (not pictured) – I love Mozzarella cheese on mine – yum! 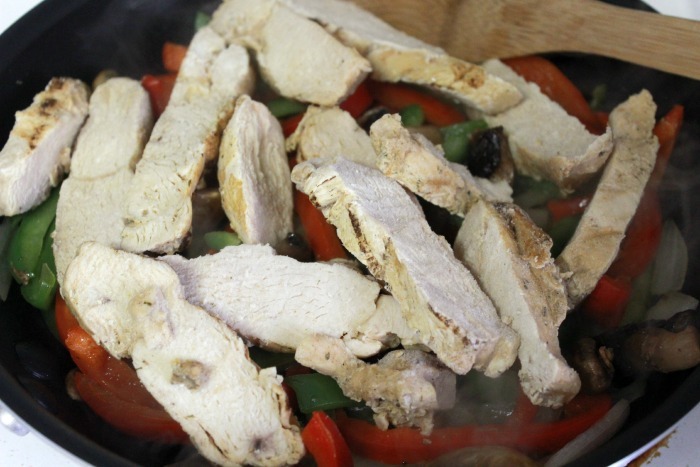 As you can see this recipe has simple ingredients and since the Tyson Grilled and Ready Chicken Breasts are already cooked they just need to be heated through – this makes for a very quick dinner! First thing you will want to do is heat up some olive oil on medium heat in a saute pan. 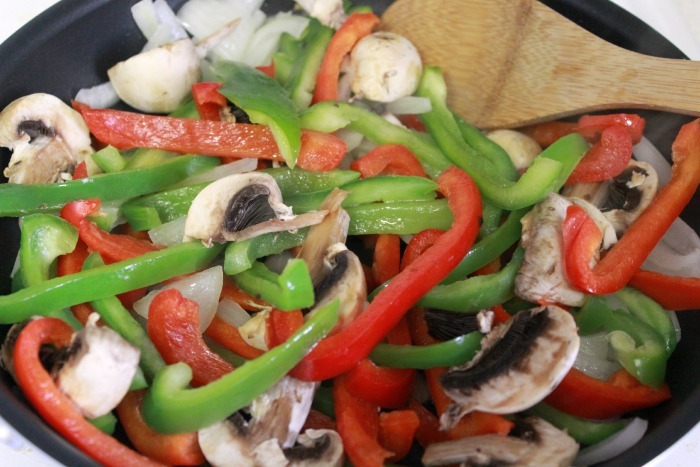 Slice up your vegetables and add them to the pan. At this point I turned up the heat to medium/high and cooked the vegetables, stirring occasionally, for about 5-8 minutes. Then I add the taco seasoning and water. Just follow the directions for the taco seasoning – mine calls for 3/4 cups water. I mix the water and seasoning together first before pouring it over the chicken and simmer for about 5 minutes. 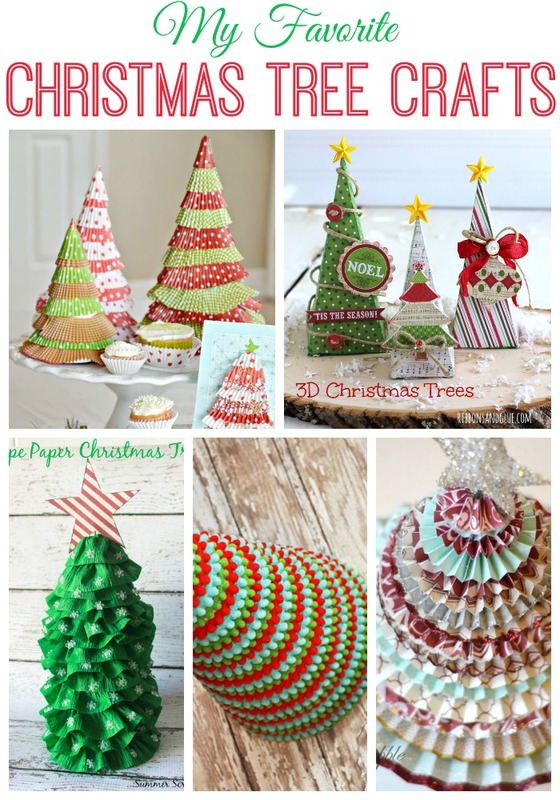 I know this is something your family wil love! I had this on the table in less then 15 minutes and everyone was able to eat so we could leave the house in no time at all! While my family is not a “Blended” family I know this movie is one we will enjoy. Myy kids are getting older (anyone want a teenager??) and they have friends that are in blended families so I know this is something they will understand and enjoy watching a movie about. 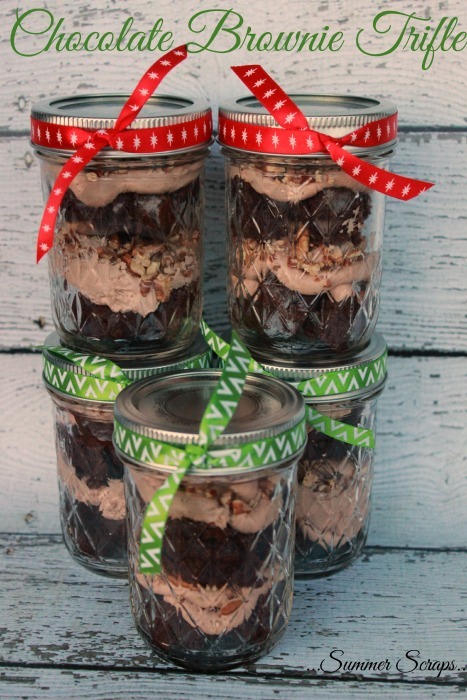 Quick, easy, and yummy! This works for me! I love the Tyson Grilled & Ready Chicken. I use it a lot in the summer when I don’t want to be in the kitchen to long. I’ll be trying this some, Summer. 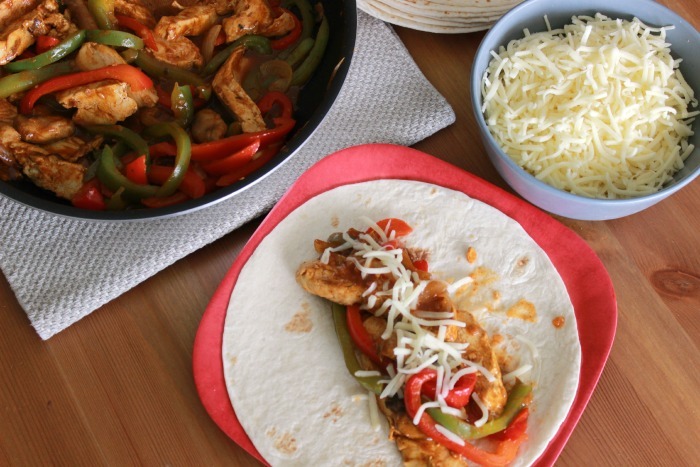 These Chicken Fajitas look so good!! And the Tyson chicken make this so much easier to make!! I had this whole plan for dinner tonight, but I think it just changed! Now I want fajitas! We could eat this every.single.night. Yum! This looks like a super easy, satisfying meal!! 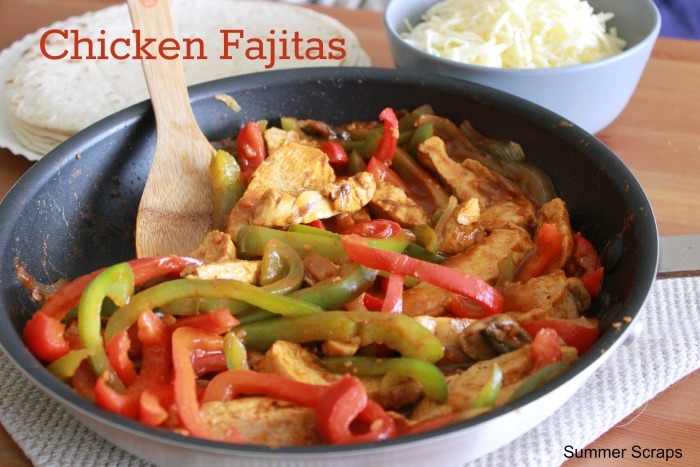 We love fajitas and we also use these to make quick grilled chicken salads too! That looks so good! I love those Tyson strips, use them all the time, so yummy and so easy! Omgsh Taco Tuesday is tomorrow and I must make this!! Chelsee recently posted…The Risks of Distracted Driving. I made this for dinner tonight. It was delish and super easy! Thanks for the recipe.